New elevator technology is promising to change the way skyscrapers are built. ThyssenKrupp, the German steel and engineering giant, has created what it calls “the holy grail” of the elevator industry: a system that isn’t dependent on ropes or steel cables that can move horizontally as well as vertically, according to Quartz. Dubbed Multi, the technology uses the same magnetic levitation systems that lift the world’s fastest trains above their tracks and because these elevators can move in a circular motion from top to bottom, more elevator cars can run on the same line, meaning less wait time. 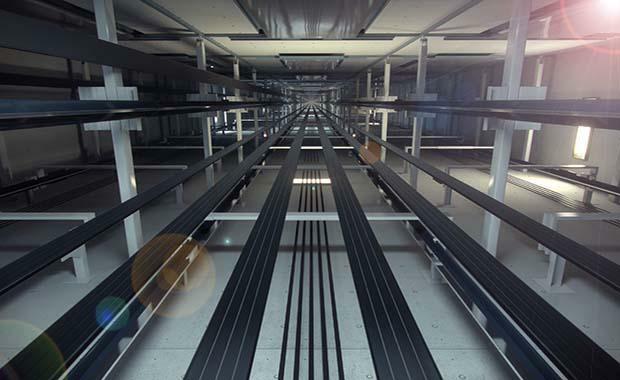 ThyssenKrupp says because the Multi requires smaller shafts than typical elevators, it could increase a building's usable area by up to 25 per cent. According to Gizmag it's lighter too, and the use of lightweight materials for cabins and doors slims the Multi down to around 50 per cent of a typical elevator's weight. The firm says that a 300-metre tall building would be the ideal starting height for the technology. The Multi is still in development, and ThyssenKrupp expects to test the system in 2016.